Bonsai is a part of ancient sacred beliefs and Eastern philosophies to be peaceful and in harmony with nature. In Japan, Bonsai is highly respected as a symbol of their culture and thoughts. Now, the time has come for a new Bonsai style, “Shohin Bonsai”. 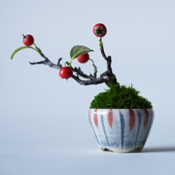 “Shohin” is a Japanese word for “a-tiny-thing.” You’ll see a fusion of the traditional Bonsai technique and spatial design art in a smaller miniature cosmos. Shohin Bonsai has become widely popular in all countries, as a piece of art, small interior accessories, and a relaxing hobby providing you with creating pleasure and sense of spirituality. 2005 Started his career as commercial Photographer at amana inc. Mainly working in the studio advertised product photography. While, the location shooting and also good to shoot a panorama of japanese life, such as a waterfall.